This venue is situated in Forest. The dimensions of the Blue Badge parking bay(s) are 470cm x 380cm (15ft 5in x 12ft 6in). 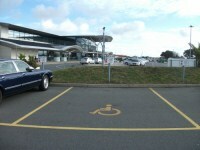 The nearest Blue Badge bay is 60m (65yd 1ft) from the Departures Entrance. 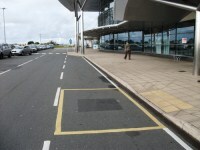 The furthest Blue Badge bay is 100m (109yd 1ft) from the Departures Entrance. 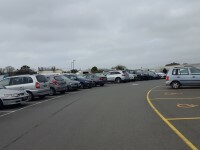 The drop off point is located immediately outside the entrances. 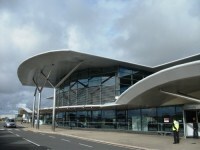 There is an overflow car park located to the left as you face the terminal building. 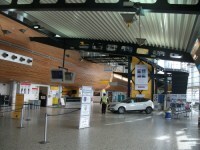 There is a taxi rank in front of the terminal building. 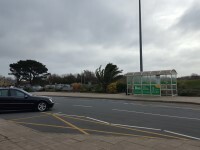 There are bus stops in front of the terminal building. 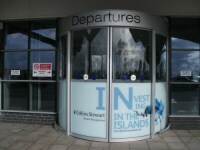 You are on Outside Access (Departures Entrance). Skip to the next section. The door opening is 174cm (5ft 9in) wide. 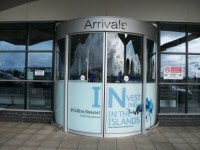 You are on Outside Access (Arrivals Entrance). Skip to the next section. You are on Main Concourse. Skip to the next section. There is step free access throughout the main concourse. 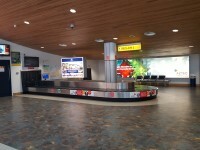 The check in desks are located ahead as you enter. The desks are a medium height. A member of staff can provide assistance with baggage. At the centre of the main concourse there is dedicated seating for passengers who require assistance. 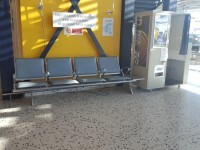 There is fixed seating throughout the main concourse, there is some seating with arm rests available. Seating is on the ground and first floor. 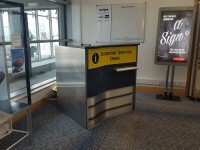 In the Arrivals area of the main concourse there are 2 car hire desks. 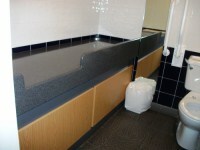 The desk are medium height and have a lowered section. You are on Reception (Information Desk). Skip to the next section. 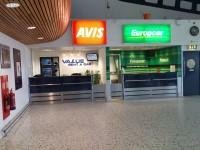 The reception desk is 11m (12yd) from the Arrivals Entrance. You are on Accessible Toilet (Main Concourse - Ground Floor). Skip to the next section. 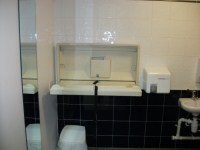 This accessible toilet is approximately 55m (60yd 5in) from the Departures Entrance. This accessible toilet is located at the rear of the concourse. The dimensions of the accessible toilet are 256cm x 143cm (8ft 5in x 4ft 8in). The baby change facilities are located in the accessible toilet on the ground floor. There are additional baby changing facilities on the first floor and in the departure lounge. The lift is located in the centre of the concourse. 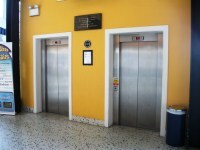 The lift is 27m (30yd) from Departures Entrance. The dimensions of the lift are 158cm x 138cm (5ft 2in x 4ft 6in). 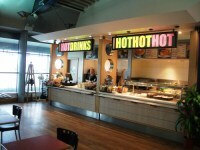 You are on Restaurant Bar Internal (Caffé Ritazza - Main Concourse First Floor). Skip to the next section. The nearest table is 15m (16yd 1ft) from the lift. 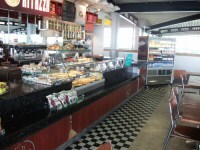 Caffé Ritazza is located on the first floor of the main concourse. You are on Accessible Toilet (Main Concourse - First Floor). Skip to the next section. 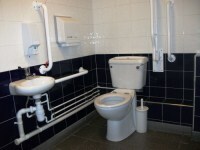 This accessible toilet is approximately 22m (24yd 2in) from the lift. 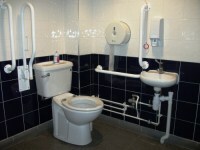 The dimensions of the accessible toilet are 200cm x 150cm (6ft 7in x 4ft 11in). You are on Security. Skip to the next section. 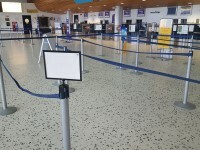 Security is located to the right of the Check In Desks. There is a security desk ahead as you enter, which is high. Boarding Passes are checked at the desk. A member of staff can provide assistance. 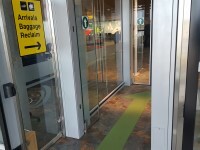 Wheelchair users go through to the opening to the left of the security barriers, the opening is 75cm wide. 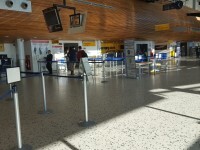 A member of the security of the team will do a security check after the barrier, if required. You are on Departures Lounge. Skip to the next section. 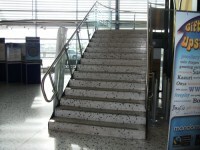 There is step free access throughout the departure lounge. 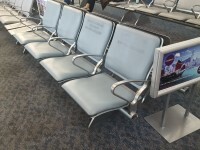 There is fixed seating throughout the departure lounge. 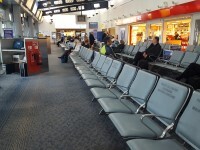 There are designated spaces for passengers who require assistance throughout the departure lounge. 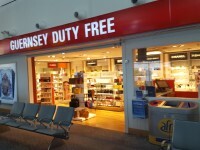 There is a duty free shop located to the left after you enter the departure lounge. 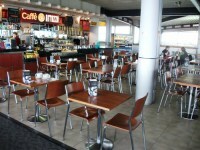 There is a cafe located to the right after you enter the departure lounge. 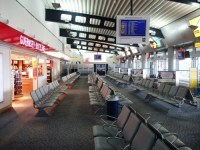 There are 5 departure gates located at the rear of the departure lounge. There is step free access to the gates. 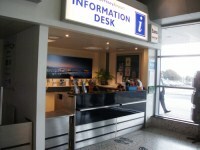 There is a high level desk located next to each desk, a member of staff can come around to a passenger to check passports and boarding passes. 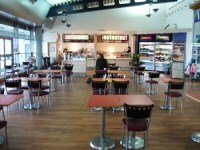 You are on Restaurant Bar Internal (The Food Village - Departure Lounge). Skip to the next section. The nearest table is 10m (10yd 2ft) from the the security check-in. This accessible toilet is approximately 32m (34yd 2ft) from the security check-in area. This accessible toilet is located in the departure lounge. 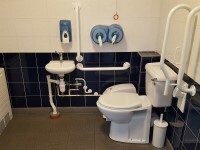 The dimensions of the accessible toilet are 200cm x 138cm (6ft 7in x 4ft 6in). You are on Arrivals - Baggage Reclaim. Skip to the next section. 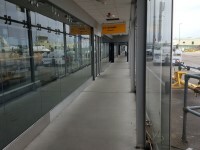 After passengers arrive at Guernsey Airport they are directed to a covered walkway leading to the Baggage Reclain. 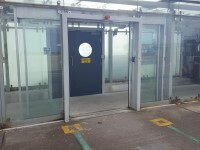 There are two sets of 100cm wide automatic doors leading into Baggage Reclaim. 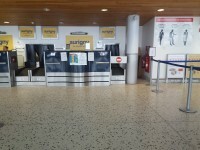 There is step free access throughout Baggage Reclaim. 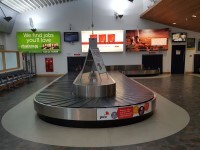 There are 2 baggage belts, both are located to the left after you enter Baggage Reclaim. There are accessible and standard toilets located to the right after you enter Baggage Reclaim. You are on Accessible Toilet (Arrivals - Baggage Reclaim). Skip to the next section. This accessible toilet is located to the right after you enter the baggage reclaim area. 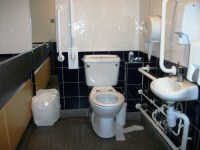 The dimensions of the accessible toilet are 168cm x 200cm (5ft 6in x 6ft 7in). 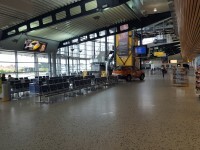 The female and male toilet facilities that were surveyed are located at the rear of the concourse, on the first floor of the concourse, departure lounge and next to the baggage reclaim.